They'd lock you up and throw away the key if you wanted to pump billions of tonnes of carbon into the atmosphere to see how it affected climate. Yet, seemingly without a care in the world, we're doing just that. Our voracious appetite for coal, gas and oil is causing somewhere on the order of 32 billion tonnes of carbon dioxide to be dumped into the air each year. By digging up fossil fuels and releasing their trapped energy, we're putting carbon back into the atmosphere that hasn't seen the light of day for millions of years. Carbon has freed us from living hand to mouth. Since our species evolved over 100,000 years ago, our numbers have ballooned to six and a half billion. To a large extent it's all thanks to carbon. Carbon has become our liberator, fuelling our economy and lifestyle. There is no doubt that a little bit of carbon in the atmosphere is good for us; it helps give our planet the pleasantly warm temperature it has today. The problem is we're tipping the balance. We're on a fast track to an atmosphere that hasn't been witnessed for some 55 million years. Although something of this age might sound so hopelessly ancient as to be of no relevance to today, there's actually a very important lesson here: the fallout from this last flirtation with a carbon-rich atmosphere took thousands of years to sort out. To find out what happened at this time we can look in the sea, or more precisely, under it. Some of the largest research ships in the world have only one purpose: to take very long, thin cores through the ocean bed. Some of these cores capture fine muds that were laid down on the sea floor over tens of millions of years. After the novelty of looking at something different has worn off, the chances are most of the cores wouldn't impress you very much; one fine mud looks pretty much like any other fine mud. But it's what's in the mud that counts. When we delve into layers from 55 million years ago, something disturbing emerges. In what appears to be a blink of an eye, the temperature of this planet went through the roof. This is the mother of all doomsday scenarios. This was the Palaeocene-Eocene Thermal Maximum (often shortened to PETM). Back in 1991, James Kennett at the University of California and Lowell Stott at the University of Southern California reported results from a core taken in the Weddell Sea off Antarctica that spanned hundreds of thousands of years. Within the core they found the remains of minuscule ocean-dwelling organisms known as foraminifera - affectionately called 'forams' - that lived at the surface and bottom of the oceans. When alive, forams take up calcium, carbon and oxygen from the seawater to form calcium carbonate shells that come in all sorts of weird and wacky shapes and sizes: some are enormous - by foram standards - and can measure up to 20 centimetres; others can be as small as 0.1 millimetres across. They're also remarkably diverse; there are somewhere around 4,000 species living within different ecological niches in the sea. But these small organisms don't have long for this world; they typically shuffle off their mortal coil within a few weeks. The important thing is that once the forams die, the shells fall to the seabed and get buried by ocean muds. Because different forams are found through the world's oceans, they can give a great idea of what the conditions were like at a particular moment in time. Looking within the foram carbonate shells, Kennett and Stott measured the amount of two forms of carbon known as carbon-12 and carbon-13. These different numbered versions of carbon are known as isotopes, and although they have the same chemical properties as one another, the carbon-13 is slightly heavier than its companion. Although it might not sound much, subtle changes in the ratio of these two versions of carbon can give important insights into what happened in the past. What Kennett and Stott noticed was that across the geological boundary separating the Palaeocene and Eocene there was a huge shift in the carbon isotopic makeup of the shells: there was suddenly a lot more carbon-12, a shift sometimes described as going 'negative'. This was unusual. The sort of change they found was not what you'd normally expect to find in forams. Not only that, but the relationship between those living on the surface - the so-called planktonic forams - and those living at the bottom - the benthics - went askew around 55 million years ago. Under normal conditions, the surface dwellers tend to have more carbon-13 than their comrades in the depths. Given the choice, living organisms prefer using the lighter carbon for growth because it requires less energy to build organic matter. At the surface there are often intense blooms as forams and other living organisms go in for a frenzy of growth. The result is that most of the carbon-12 is used up, leaving only the heavier isotope for making the carbonate shell. But in the depths, the water gets a regular flurry of dead organic matter from the surface (Figure 1.1). There's a lot less life down there, so the forams can be more choosy in building their shells with the lighter carbon. Across the Palaeocene-Eocene boundary, this traditional difference disappeared, and regardless of where in the ocean the forams lived, the shells all contained more of the lighter carbon. Other things also suggest that this time was topsy-turvy. Alongside the big shift in carbon isotopes was a mass extinction of benthic foraminifera. Somewhere between 35 and 50% of all ben-thic forams were lost at this time, making it one of the largest extinctions of the past 90 million years. Something out of the ordinary must have happened. Kennett and Stott pointed the finger at massive global warming. As the seawater temperatures rose, they argued, the amount of oxygen reaching the bottom of the world's oceans crashed. It was a recipe for extinction on a colossal scale. produced by a micro-organism called crenarchaeota. These uninteresting looking organisms are a type of bacteria that are found in oceans and lakes. They might not be very easy on the eye, but crenarcheota are a gold mine when it comes to reconstructing past climates. During growth, the water temperature controls the production of a lipid called tetraether in their membrane. When the little critters die this lipid falls to the sea floor and becomes locked up in the sediment. By measuring the tetraether within sediments that were laid down in the past, it's possible to come up with a temperature scale called TEXg6. To simplify matters, I'll just call it the TEX scale. The key thing is that the TEX result from 55 million-year-old Arctic sediments shows that temperatures rose to as high as 25 °C. But what does this number mean? Climate implies average conditions. But it's often not possible to reconstruct past changes at the daily, weekly or monthly level. In most cases, a proxy of the conditions will give us at best a decadal average, and often for just one part of the year, such as the growing season. Unfortunately, averages are far from the whole story. They tend to paint an image with a very broad brush. If the weather is largely unchanging, then the average can be thought of as the 'climate'. But this is often not the case. Just imagine two different years for where you live. In one year not a lot happens. It rains through the year, farmers produce a reasonable amount of food and generally speaking most people are happy. Fast forward a few years, and consider a year where for most of the time no rain falls. Drought ensues, but during one day, a whole year's worth of rain falls. Taken as an average, the amount of water that fell on the land was the same, but the pattern couldn't have been more different. It's pretty hard to pick up this sort of difference in the past, particularly when you're dealing with time-scales of millions of years. The best we can hope to do is sample at the highest resolution possible. But even then we're dependent on what sort of record we're looking at. We'll see later how some proxies - such as trees, corals and ice - can be used to find out what happened year by year, but in the meantime just bear in mind that some reconstructions might be skewed to the average of one season over several years. This is not the disaster it might at first appear; it's important to try understand how the seasons behaved in the past. In the case of the TEX reconstruction through the Paleocene-Eocene, most of the lipids being put down on the sea bed would have been made when there were blooms on the surface, suggesting that the temperature of 25 °C probably represents summer rather than an annual average. Even so, it must have been pretty warm all year round because the poles were free of ice. The tropics, which tend to be less prone to big temperature changes, warmed by 5 °C. The evidence all seems to point to the world experiencing a devastating hothouse. It's this period of warmth that's been dubbed the Palaeocene-Eocene Thermal Maximum. In different parts of the world there were massive changes in the flora and fauna. If you had been able to visit the Norwegian archipelago of Svalbard at the time, you'd have found a climate similar to today's Florida, with crocodile-like beasts and plant-eating creatures living in a temperate rainforest. Turtles thrived on Ellesmere Island in the Canadian Arctic. In the east Russian peninsula of Kamchatka, palm trees grew. Whereas before, most mammal groups had been confined to Asia, during and after the warming many of these migrated into Europe and North America. Clearly big changes were put in train by the warming. The PETM is now thought to have occurred over 160,000 years or so, with the big shift to lighter carbon taking place over some 30,000 years. It might well be that the changes were faster than this, but with ocean sediments spanning such a distant period of time it's hard to tell. As a result, I'll stick with the best, albeit conservative, estimate we have. The warming in the deep gave a massive hint that something had happened to the ocean's circulation. Today's ocean takes warm surface waters from the tropics up to high latitudes; evaporation concentrates the sea salt and the water progressively cools. Eventually the water becomes dense enough to sink, forming deepwater which then heads equatorwards through the ocean depths. The winds and tides mix up the ocean, allowing the deep-water to well back up to the surface, where it is then warmed enough to flow polewards and repeat the whole process. We'll look at this more closely later on, but for our purposes this description will suffice. During the Palaeocene it looks like something similar to today's circulation was in operation. The major uncertainty was whether it changed once the warming kicked in. Flavia Nunes and Richard Norris of the University of California hit upon a rather neat solution to work out what happened in the ocean. Typically, the longer any deepwater is separated from the surface, the more nutrients it collects, largely because dead and decaying material falls to the ocean floor. Those benthic forams living under the sites of deepwater formation are bathed in seawater that has only just left the surface. As a result they tend to have little of the light carbon because most of it has been used up at the upper levels. But the further you go along the flow of deepwater, the forams progressively gain more of the lighter carbon from the surface. Taking 14 deep-sea sites from around the world, Nunes and Norris measured the changing ratio of the different isotopes of carbon in the shells of benthic forams. What they found was stunning. Before and after the PETM, the sites with the most carbon-13 were in the high latitudes of the southern hemisphere, suggesting that most of the ocean deepwater was being formed there. But within the first 5,000 years of the start of the PETM, there was a major change: the northern hemisphere benthic forams suddenly showed more carbon-13 than their southern counterparts. For at least 40,000 years, it looks like deepwater suddenly switched from being made in the south to the north. It then took another 100,000 years before circulation reverted to its previous state and business as usual was reestablished. Washington showed that the carbon isotope shift within the ocean also took place on land. Animal teeth and carbonates found in soils dating to 55 million years ago showed a similar big shift to lighter carbon. Whatever had caused the big change in carbon was not unique to the ocean. It had to have affected the whole carbon cycle. The most obvious culprit was a huge pulse of gas. But how could a gas be the cause of such a big change? Virtually all the energy that drives the world's climate comes to us from the Sun. Each day we're bathed in the stuff. It drives the oceans and the atmosphere; it makes life possible. Without it our planet would be a desolate hole. But this energy doesn't come to us in one form; it's a package of different sized waves. Disconcertingly, these waves are known as radiation, but they have nothing to do with radioactive decay. The term radiation simply comes from the Latin word radiare, which means to emit rays. To understand climate and the changes that are happening we need to look briefly at how the Sun's energy gets to us. A good way to visualize this is to throw a stone into your local duck pond: assuming you miss the local wildlife you'll see a series of ripples move out from the centre, each made up of a peak and a trough. Now if you throw lots of different sized stones onto the same point, lots of different sized waves will be created. As the waves travel across the pond's surface they transfer energy from the centre to the edge. In much the same way, the energy from the Sun comes to us with a range of different sized waves; it's just that we can't see all of them. We're most familiar with the wavelength of maximum radiation from the Sun: visible light. Because it dominates, our bodies have evolved to sense its energy. The size of the waves of sunlight, however, is a lot smaller than our efforts in the pond; the distance from peak to peak (or trough to trough) is only 0.0004 to 0.0007 millimetres. Other wavelengths of energy produced by the Sun need specialized equipment to be detected. Of particular importance to our story are ultraviolet light - often referred to as UV -which has a slightly smaller wavelength than visible light, and infrared light which has a somewhat longer wavelength. Of the 64 million watts per square metre that the Sun produces, the same area at the top of our atmosphere sees only around 1366 watts (the so-called solar constant). Crucially, not all this energy reaches the surface. Some, for instance, is scattered by particles in the air. When you look up at the sky on a cloudless day you're inadvertently watching this process; of all the colours in the spectrum, blue is the most strongly scattered, dominating the sky. On average, however, about 30% gets reflected back out to space by dust and clouds in the air and off the ground. A further 20% is absorbed in the air by water vapour and clouds, while the remaining 50% is absorbed by the Earth's surface, causing warming. It's important to realize that any object with a temperature above absolute zero (defined as -273 °C) gives off energy. As a result, virtually everything does so. Our bodies are warmer than absolute zero and therefore give off energy. This book is above absolute zero, so it too is giving off energy. The Sun's surface temperature is around 6000 °C and radiates a lot of energy, most of it at very short wavelengths. Our planet, though, is much cooler than the Sun, so most of the energy absorbed at the surface and by the atmosphere is stretched out and given back off as infrared. Not all of this infrared energy goes straight out into space, however; some is intercepted by clouds and, importantly for our story, gases in the atmosphere. The idea that our planet's atmosphere may help keep things warm was first proposed by the French scientist Joseph Fourier; in 1827 he used the analogy of a 'glass bowl' and suggested that gases in the air let the sunlight through but kept the infrared in, heating up the Earth's surface temperature. In truth, a 'greenhouse' is not a great analogy for our planet. It was only realized in 1907 that real greenhouses work by stopping air currents carrying away heat absorbed from the sunlight. In contrast, the atmosphere stops heat from escaping the surface. It's not a disastrous comparison, because the image of 'greenhouse warming' is useful for describing the general idea, but just be mindful that the analogy can't be taken too far. One of the first to be intrigued by what role gases might have had on past temperatures was an Irish scientist called John Tyn-dall, who was based at the Royal Institution in London during the mid- to late 19th century. A popular public speaker, his afternoon lectures used to contend with the latest shows in the West End and would routinely block the streets with carriages containing the great and the good. In 1861, he reported to the Royal Society that he had measured the absorption properties of a suite of gases after he had shone a beam of infrared light through them. Tyndall realized that the main constituents of air - oxygen and nitrogen -were hopeless at absorbing any infrared light and caused virtually no heating. But much to his surprise, Tyndall found that carbon-containing gases in the air - he measured carbon dioxide and eth-ylene - could play a huge role. He also realized that it wasn't just these gases that might be significant; water and nitrous oxide (better known as laughing gas) also had a big effect. Tyndall suggested that differences in the amount of these gases in the atmosphere might have driven past changes in climate. The great American scientist Samuel Pierpoint Langley, who was director of the Allegheny Observatory in the late 19th century, followed up Tyndall's work. Langley set up a series of experiments on Mount Whitney in California to measure how much heat the atmosphere absorbed. Seemingly tirelessly, he would routinely trek up the mountainside to make his measurements. On his many visits he noticed 'fossil' trees above the upper limit of today's tree lines and wondered whether past changes in the way heat is transmitted through the atmosphere might have played a role. In 1894, he produced the first measurements of which wavelengths were absorbed at the Earth's surface. Crucially he found that infrared light was absorbed by water and carbon dioxide. The game was on. It was a Swede called Svante Arrhenius who picked up the baton. Arrhenius' pioneering work in Stockholm put forward the strongest case that carbon dioxide was a major player in past climate changes. He was the first to calculate how much a change in the concentration of carbon dioxide within the atmosphere would affect the temperature. Drawing on work by a geologist called Arvid Hogbom, Arrhenius wondered whether a fall in the number of volcanic eruptions might have led to less carbon dioxide in the atmosphere, plunging the world into an ice age. In 1895, he drew on Langley's results and crunched the numbers. He found that a halving of carbon dioxide should bring the world's temperature down by 5 °C. But an increase in carbon dioxide by 50% might lead to a warming of 3 °C and a doubling should drive temperatures up by nearly 6 °C. Arrhenius also realized that as temperatures increased, more water vapour would end up in the atmosphere, trapping more heat and exaggerating any initial warming from carbon dioxide. But Arrhenius had no comprehension of just how fast we could put greenhouse gases - what he called 'selective absorbers' - into the atmosphere. He thought it would take a few thousand years before the use of fossil fuels would increase the amount of carbon dioxide in the atmosphere by half again. And even if it did, it probably wouldn't be a bad thing: 'we would then have some right', he suggested, 'to indulge in the pleasant belief that our descendants, albeit after many generations, might live under a milder sky and in less barren natural surroundings than our lot at present'. It does sound great. But not everyone was sold on the idea. One complaint was made by Swede Knut Angstrom at the turn of the 20th century; he did some experiments and argued that water vapour blocks much of the same infrared radiation as carbon dioxide; it therefore can't have played much of a role in past climate change. Angstrom was essentially saying that the water content of the air was the most important factor; you could change carbon dioxide all you liked, it wouldn't make any significant difference. Angstrom's rebuttal swayed a large part of the scientific community with the result that Arrhenius' idea was pushed to the fringes. A brief attempt in 1938 by the British engineer Guy Callendar to resurrect the concept unfortunately also fell on deaf ears. It was only realized in the 1940s that Angstrom was wrong; the absorption properties of greenhouse gases change with altitude, yet Angstrom had completed all his experiments at sea level; his results couldn't be extended to the whole atmosphere. Why Angstrom was wrong is actually a crucial point and it's worth just pondering in detail for a moment because it's an excellent way to explain how global warming really works. Imagine that the atmosphere is carved up into lots of horizontal layers from the surface up into space; the lowermost layer contains a mixture of gases, including carbon dioxide and water. When infrared is given off by the Earth's surface, some of it gets intercepted by the gases in this lower layer; these then may give the energy back out or use it to collide with neighbouring molecules, thereby warming the air. As you go up through the atmosphere, each layer does the same with the energy it receives from down below. Ultimately, less infrared reaches the upper levels. This is all fine and dandy when the concentration of gases in the atmosphere stay the same. The amount of energy entering the system is pretty much in equilibrium with what is going back out to space so the temperature remains largely constant. Unfortunately for Angstrom (and arguably for all of us), although the wavelengths of energy caught by water and carbon dioxide broadly overlap at sea level, they don't the higher up you go. Big gaps open up. As the altitude changes, water vapour absorbs different wavelengths of energy compared to carbon dioxide. These gaps can be plugged by carbon dioxide, which we're now happily pumping into the atmosphere. The result of this is that with more greenhouse gases in the atmosphere, less heat is escaping to space and the whole place is warming up. In spite of its uncertain role, the beginning of the 19th century marked the first measurements of carbon dioxide in the air. In contrast to the common gases like nitrogen and oxygen which are measured in terms of percentages, most greenhouse gases are in relatively low abundance. You might have read that the amount of carbon dioxide in today's air is around 380 parts per million -or ppm - and rising. The ppm simply means the proportion of a gas relative to the total amount of other gases in dry air. Because the amount of moisture in the air is so variable across our planet -consider the difference between the Sahara Desert and the Highlands of Scotland - the water content is not included in the calculation for the purposes of comparison. So 380 ppm is the same as writing that there are 380 molecules of carbon dioxide for every million molecules of dry air. There are of course other greenhouse gases, some natural and others produced by humans. Methane is arguably the best known, probably because of its association with flatulent livestock. Significant amounts are also produced by wetlands. Although there is a lot less methane in the air than carbon dioxide, it absorbs somewhere between 20 and 25 times more heat. Good old laughing gas - nitrous oxide - is naturally produced by soils and the oceans. In the past its levels were fortunately low, since nitrous oxide is 300 times more effective than carbon dioxide at heating the atmosphere. Together, they all add up to keeping our planet at the balmy temperature we enjoy today. The question is, if there was drastic warming 55 million years ago, what were greenhouse gas levels doing at the time? A whole host of different carbon sources have been suggested for the extraordinary isotopic shift seen during the Palaeocene-Eocene Thermal Maximum. It pointed to an enormous amount of gas going into the atmosphere with very little carbon-13. Comets were one idea. A global conflagration of burning peat and coal has also been proposed. But the very low carbon-13 in the oceans and land smacked of methane. Compared to the other carbon gases, methane has little of the heavier isotope. Not only this, but vast reserves of it exist in the form of ice crystals known as methane hydrates (sometimes called clathrates). Estimates vary, but the amounts involved are enormous; somewhere on the order of several thousand gigatonnes of carbon exist in this form. To put this in some sort of perspective, this is equivalent to all other fossil fuels combined. If just 10% of the methane hydrates were to escape in a few years, it would have the same effect as a tenfold increase in atmospheric carbon dioxide. This is apocalyptic stuff. Methane hydrates are found within the pore spaces of cold offshore sediments on the continental margin, and in some frozen ground (such as in Siberia). In the oceans, the methane is formed by microbes that break down organic matter after it has fallen to the sea floor, mostly within water depths of 300 metres. The resulting methane has very little carbon-13. If the methane is released relatively slowly from the ocean floor, other microbes can break it down quickly, so that it causes relatively few problems. But if the release is large and from a shallow part of the continental margin, most of the methane could get to the surface unaltered. Unfortunately, although bound up, methane hydrates are not that stable. If the temperature increases and/or the pressure is reduced, there could be a massive belch as the methane is released from its prison. Methane hydrates have been spotted seeping out off the coast of Santa Barbara, California. It's clearly happening today. The big unknown is whether this is unusual and the start of something bigger. During the PETM, the evidence certainly points to methane driving the warming. The carbon isotope shift is a strong clue. But so too is the fact that in some of the north and central Atlantic ocean cores there are no foram shells. If gigatonnes of methane were released into the ocean, it would have exhausted the oxygen of the deep sea as it was turned to carbon dioxide. And if that weren't enough, lashings of carbon dioxide would have made the oceans more acidic, dissolving any carbonate. It wouldn't have been a pleasant time to be around. With the higher atmospheric temperatures during the PETM, more warm water would also have got into the deep ocean, causing more methane hydrates to melt. But this sounds a bit like a chicken and an egg situation. Escaping methane may have exacerbated the heating of the ocean, but what drove the first pulse of warming? Something must have started the warming in the first place. The problem is that the vast amounts involved should have left physical scarring on the seabed. But nothing relating to methane hydrates has been found. Could another source of methane be the cause? Although methane hydrates are the drug of choice for the apocalyptic soothsayers, there is a surprisingly more worrying scenario. In 2004, Henrik Svensen and colleagues at the University of Oslo reported a fascinating find. Within the M0re and V0ring basins of the Norwegian Sea they found a huge sill comprising basaltic rock that had intruded within ancient, organic-rich mud-stones. The sill had formed when lava welled up from deep below the surface during the opening up of the Atlantic some 55 million years ago. Svensen and his colleagues found several hundred vents emanating from the sills that had punched through the overlying mudstones. They suggested that when the sill had formed, the carbon in the mudstones would have been baked to temperatures greater than 100-200 °C. The baking would have produced methane that escaped explosively to the ocean floor and beyond via the vents they discovered in the M0re and V0ring basins. Could the shift in the isotopes have been driven by methane formed from baked mud? It would certainly explain the initial massive temperature increase. But it was unclear whether the thick layers of basalt were formed at the same time as the warming began. Now before we go any further, let's just draw breath and sum up what we think happened during this crazy period. We can split the PETM into three phases. 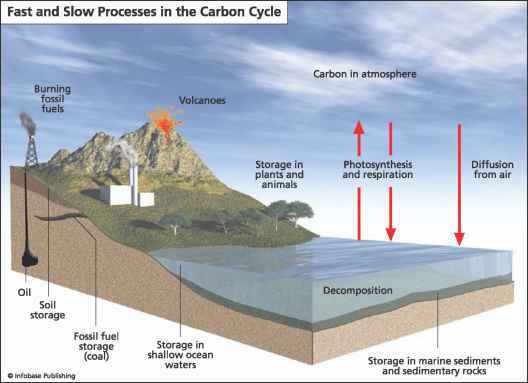 First, it looks like a vast amount of carbon was rapidly released into the ocean and atmosphere. This probably happened in less than 2,000 years, but drove massive warming over 30,000 years or so. After this period, warm conditions persisted for another 60,000 years. It then took another 70,000 years before temperatures started to drop and get back to what they were before. The uncertainty was whether the warming really did happen during the opening of the Atlantic. Was it just a coincidence of similar ages? In 2007, Michael Storey and colleagues from Roskilde University addressed this question. During such a momentous event as the birth of a new ocean, thousands of volcanic eruptions would have spewed somewhere between five to ten million cubic kilometres of magma. It was one of the largest splurges of magma in the past 250 million years. Storey and colleagues precisely dated the duration of this massive phase of eruptions. Critically, they showed that the Atlantic spreading and warming of the PETM happened bang on the same time. And the age? 55.6 million years ago. Although methane only stays in the atmosphere for about 12 years before being broken down, it can have a devastating warming effect; not only is it a powerful greenhouse gas in its own right, but the methane gets turned into carbon dioxide which lasts for a further 100 years or so in the atmosphere, continuing the warming effect. But reconstructing past changes in the amount of carbon dioxide is notoriously difficult. On the scale of millions of years, we have to resort to proxies of what was in the air. Anything we can draw on will give at best an indirect measurement and is limited to only some key gases. Fortunately, in spite of what is a relatively small concentration, carbon dioxide does have a major impact on different biological and chemical processes. One of the better-known proxies for carbon dioxide are the stomata found in leaves. These 'breathing holes' act as the point of exchange for carbon dioxide and water, allowing the plant to grow and respire. It's a delicate balance; if the stomata are open for too long, the plant can die from loss of water; too little and not enough carbon dioxide is fixed by the plant for growth. However, plants are generally more efficient at fixing carbon dioxide when levels are high, and as a result they tend to lose some of their stomata as the concentration goes up. The problem is that different proxies reconstruct different atmospheric carbon dioxide levels during the PETM. Estimates range from 100 to 3,500 ppm, with leaf stomata often giving the lowest reconstructed values. Given what we know was happening to the carbon cycle at the time, the low end of this range seems pretty unlikely. 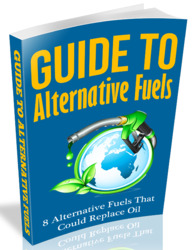 An alternative approach was recently suggested by Tim Lowenstein and Robert Demicco at the State University of New York. Instead of looking at a biological system to understand what the atmosphere was doing during the PETM, they proposed using the known properties of minerals made up of sodium carbonate. Sodium carbonate can form a plethora of minerals that precipitate within waters exposed to different concentrations of carbon dioxide. In the western United States, long-lasting lakes laid down sediments rich in minerals of sodium carbonate through the PETM. In the Green River basin, a 300 metre thick section of nahcolite (sodium bicarbonate) has been found: within the nahcolite are small layers of common salt. Experimental studies show that the presence of nahcolite and salt means that the level of carbon dioxide in the air must have been more than 1,125 ppm. With temperature reconstructions for the area, the Green River basin suggests that the early Eocene carbon dioxide levels were somewhere between 1,125 and 2,985 ppm. This is a staggering amount; it's way beyond the level we have today. These values would certainly explain the humungous warming seen during the PETM. But it didn't last forever. Above the Eocene levels in the Green River basin, the main sodium carbonate mineral switched to something known as trona, which can't precipitate above 1,125 parts per million. By around 20 million years ago, all the evidence seems to point to carbon dioxide falling to levels comparable to today. So it looks like the oceans were the origin of this nightmare period. Yet as the climate shifted to wetter and warmer conditions, productivity in the surface of the ocean boomed. Off what is now New Zealand, this appears to have been driven by an increased supply of nutrients from neighbouring land masses. Over time, the oceans seem to have acted as one enormous biological pump, sucking greenhouse gases out of the air and dumping the organic matter onto the seabed, locking away the carbon. But this might not be the saviour we'd like to imagine for the future. It's not the great get out of jail free card that it might first appear. It took around 70,000 years to get the temperatures back to where they were before the PETM. There's no doubt it can help over the long term, but it doesn't look like it had much immediate effect 55 million years ago. It's easy to just focus on carbon dioxide levels when we look at global warming, but if we really want to understand the scale of the problem we need to take account of all the other greenhouse gases. The different heating values of these gases can be combined to give a value equivalent to carbon: the so-called carbon dioxide equivalent. How high can the carbon dioxide equivalent get before we're in trouble? Arguably we're already in trouble, but if we want to avoid setting off a series of changes that will be impossible to stop, we need to keep world temperatures from rising more than 2 °C. This might not sound much, but it hides a range of regional climate extremes that would result in devastating impacts on our planet's flora and fauna. How this translates to greenhouse gas levels is still being debated. Essentially it's all expressed as probabilities of risk. A recent paper suggests that the odds are only in our favour of keeping below 2 °C - with an estimated risk of 28% - if the equivalent level is kept to 400 ppm; a value of 550 ppm has a 68 to 99% chance of breaching 2 °C. It's not very heartening when we add together the heating capability of today's greenhouse gases and find we're at around 460 ppm. We're already beyond a safe level. Although the amount of greenhouse gases in the atmosphere is dangerously high, this is just part of the story when it comes to warming our planet. Other factors also play a role in controlling the temperature of our atmosphere, and some of these help to cool things down. One example is sulphur dioxide given off during volcanic eruptions; this can react with moisture in the air to form a fine mist of sulphuric acid droplets. These aerosols have an impact on the world's climate by directly reflecting heat back from the Sun. But they also attract water in the air to form clouds, which in turn can also reflect heat back out to space. The result is that eruptions can significantly cool the planet; the more sulphur that's emitted, the colder it gets. When the Philippines volcano Mount Pinatubo erupted in 1991, the amount of sulphur that was given off helped cool the world's surface by 0.5 °C during the following year. The same sort of effect kicks in with the burning of coal. As more coal-fired power stations are being used to generate electricity - China alone is opening the equivalent of two coal-fired power stations a week - some of the associated sulphur dioxide forms aerosols, helping to offset the direct warming effect of the greenhouse gases and giving us a brief respite from the worst effects of climate change. All these cooling effects mean that on balance we're at about 375 ppm equivalent. But there's a sting in the tail. Aerosols generally have a shorter lifetime in the atmosphere than most greenhouse gases. As we've seen already, a molecule of carbon dioxide hangs around in the atmosphere for around a century, whereas many aerosols only last for several days before they're stripped out of the air by rainfall. The implication is that, as we start to clean up the world's power stations, the cooling effect from aerosols will lessen, allowing the full warming effect of greenhouse gases to become apparent.We have to get our emissions down and fast. Even a delay of five years could be too long. This might all sound a bit too apocalyptic. After all we're unlikely to keep going on a reckless high emissions spending spree. Or are we? The PETM shows that if you suddenly release a vast amount of hydrocarbons into the atmosphere you get catastrophic warming. Worryingly, although we reconstructed what the carbon dioxide levels were like through this time, we have to remember that this gas probably originated as methane from the oceans. We can use the shift in isotopic values in the forams to calculate how much methane must have been released. To balance up the numbers, more than 3,000 gigatonnes of carbon must have been released. To put this in some kind of perspective, we have relatively easy access to oil and coal that amount to around 5,000 gigatonnes of carbon. The warming 55 million years ago tells us that we mustn't exhaust all of these fossil fuels. If we do, the only thing it will help will be a property boom in Kamchatka. But if the PETM demonstrates how warm our world can get, is it possible that the Earth's climate is capable of veering to the other extreme? It might seem inconsequential to know if the world can freeze over, but here lies an important lesson on how climate changes can be greatly exaggerated.